After a month or so spent getting my running legs solidly underneath me, I figured it was finally time to head west into the mountains and climb something. After looking at destinations relatively close to Boulder, I chose St. Vrain Mountain, a peak located on the border of Rocky Mountain National Park and the Indian Peaks Wilderness. It's always nice to start a hike by knowing, for sure, that you're on the trail you think you should be on. 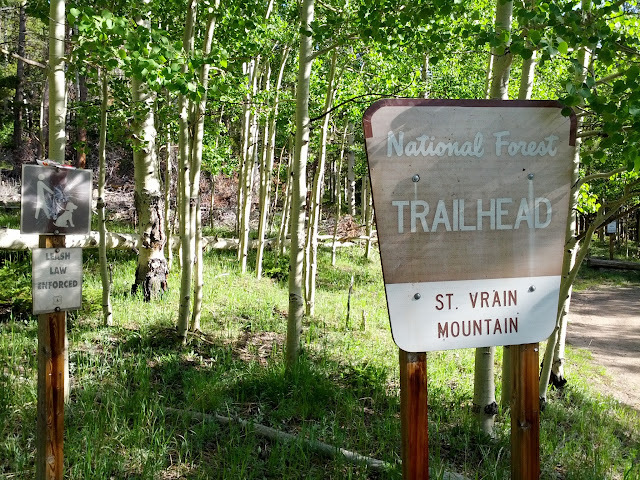 While St. Vrain isn't that far from Boulder as the crow flies, getting there meant driving northwest to Lyons and then southwest to Allenspark. Thankfully, the gravel road south out of Allenspark was in great shape and it wasn't far to the trailhead. I was a little surprised at the lack of trail register, and that made me think that maybe this trail gets used less than I thought. 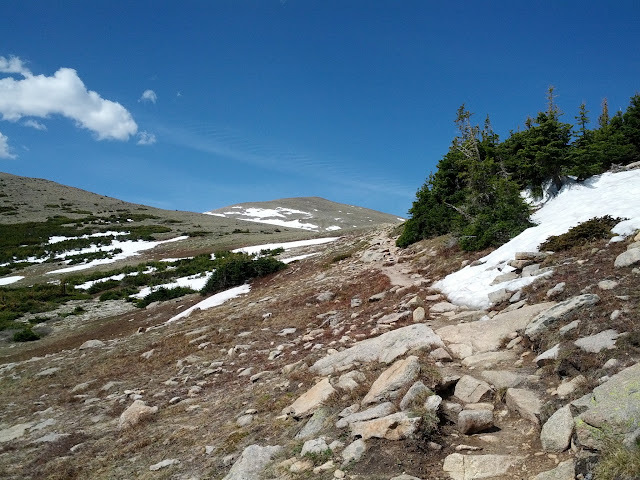 I started hiking around 8:20 on good trail and was soon in the Indian Peaks Wilderness. 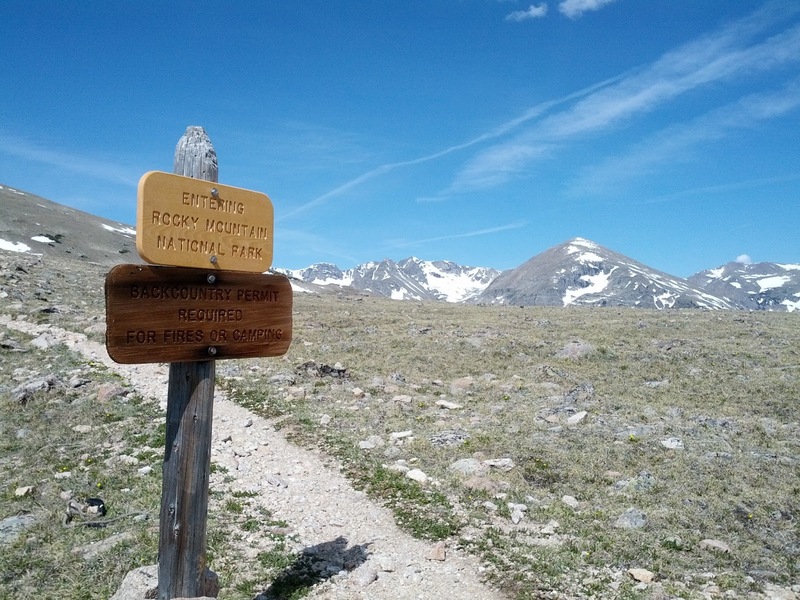 It's not far from the trailhead to the boundary of the Indian Peaks Wilderness. The trail stays mostly just to the north of the creek and the grade is pretty steady with few switchbacks. At about N 40° 10.2' W 105° 33.5 it turns south and crosses several snowmelt streams, but soon turns back north again. It was warm over the first few miles, but thankfully I started to feel a cool upslope breeze once I neared treeline. I was trying to move quickly, and even though I'm in pretty good physical condition it's still a workout to average 2 miles per hour going uphill with a pack. Most of what I carry on a hike like this, by weight, is liquid -- 3 liters of water and a liter of Cytomax. Since I did this hike alone, I threw in my full first-aid kit as well as some survival gear. I think smartphones have reached the point where I can carry less technology. I'm sure a few years ago on a climb like this I would have carried a phone, a camera, a GPS receiver, a GPS tracker for later geotagging photos, and an mp3 player. Now the phone is also my GPS, geotagging camera, and my mp3 player. (Tip: Turn on airplane mode to save your battery, which otherwise will drain quickly in the mountain if your phone stays busy looking for a signal.) I took my hiking GPS just in case, although I'm sure I would have been fine without it. There was a little snow across various parts of the trail, but it looked more like July 4th conditions than June 4th. If there was anything that really slowed me down, it was the 5-10 small snow crossings I dealt with along the trail. Usually the snow was firm enough to walk over but I postholed enough to make it inconvenient. Still, it's amazing (and worrisome) to have so little snow left this early in the summer. Looking back down valley, you get a reminder that you're really just at the edge of the mountains, with the plains beyond. It had been so long since my last hike that I almost forgot how much I love being at treeline. The views open up, you're exposed to the full effects of the sun and wind, and I always make the mental note that "If the weather goes bad, this is where I need to get back to -- fast." Everything struggles to survive up here, as evidenced by the Krumholtz. 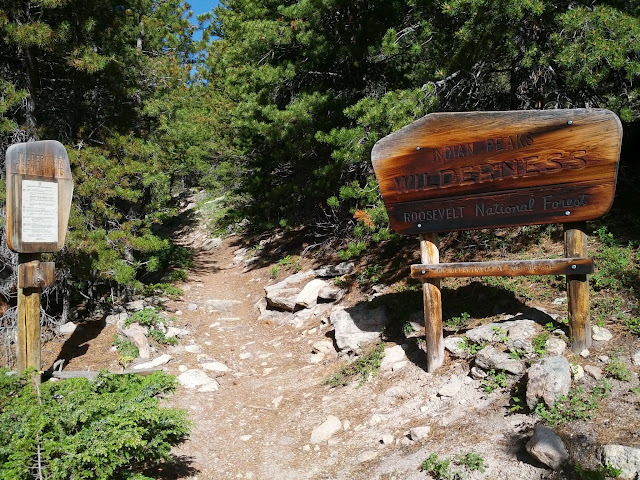 There is a fantastic stretch of trail on this route that starts at treeline -- the trail levels and smooths as you cross into Rocky Mountain National Park and you get some great views of bigger mountains to the north. The sign said Rocky Mountain National Park, but I looked everywhere for a visitor's center and found nothing. I think somebody was playing a trick on me. I wish I could have stayed on that trail longer, but it wasn't long before I was at the base of St. Vrain Mountain and it was time to head up. There was still plenty of snow on the east slopes of St. Vrain, and thankfully it was still early enough for the snow to be a good firmness for climbing and not steep enough to risk a fall. I read reports of a climber's trail but I'm pretty sure it was still mostly buried in the snow. 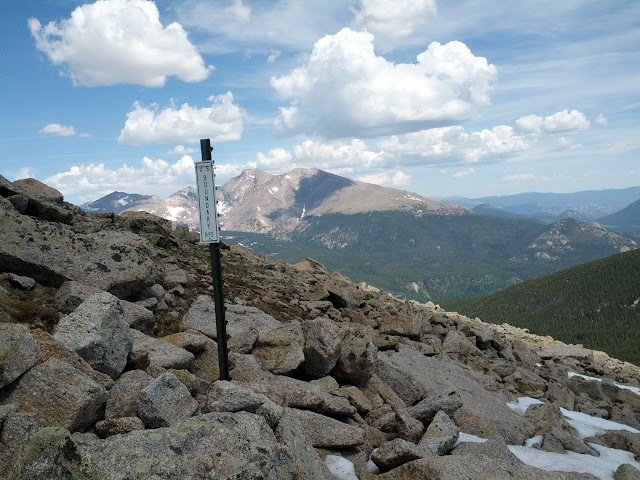 To reach the summit of St. Vrain Mountain you leave the trail and head pretty much straight up the hill along the RMNP and Indian Peaks Wilderness boundary. The familiar flat-topped summit of Longs dominates the northern view. After 3,000 feet of climbing my legs were growing a bit tired and I slowed, but that's to be expected. Even with trying to keep an average pace above 2 miles per hour, I love how the good climbing of a summit push slows to a near crawl. I had RunKeeper tracking my progress and talking into my ear saying things like, "Current Pace...110 minutes per mile." 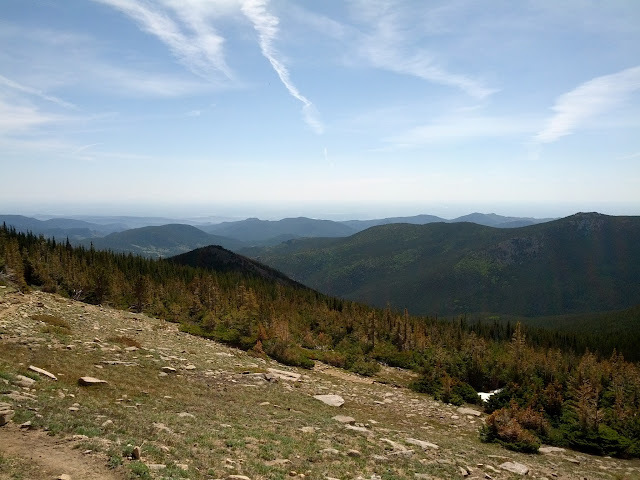 There's nothing particularly spectacular about St. Vrain Mountain itself, but the views from the summit are pretty good. Surprisingly, I didn't spend much time looking west, as all the best views were either north into RMNP or south into the IPW. This panorama looks south on the left into the Indian Peaks Wilderness and north to the right into Rocky Mountain National Park. I settled into the wind break on the summit, ate my lunch, and listened to (of all things) a Fresh Air interview with David Alan Grier. The skies above me were clear, but the clouds directly over Longs Peak were darkening. As much as I enjoy the peace and rest of a summit, I enjoy avoiding lightning strikes even more, so I packed up and headed back down the hill. 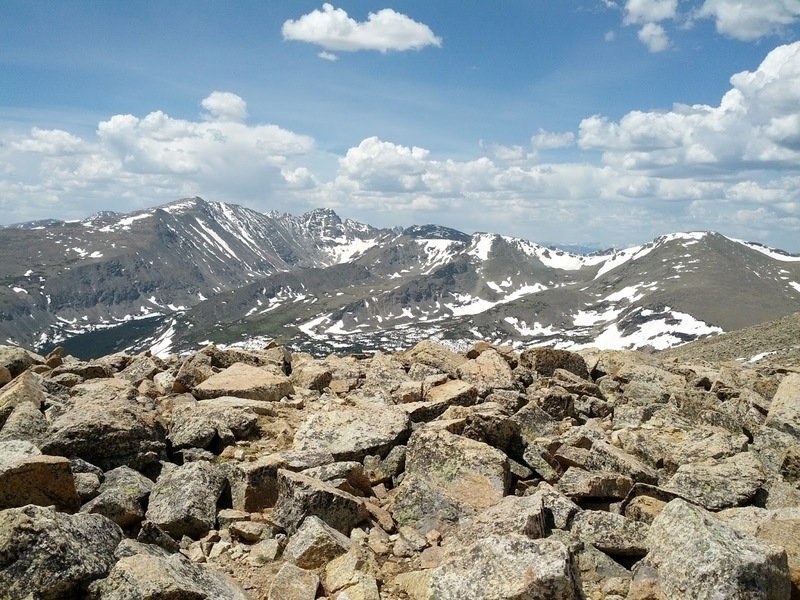 My last shot from the summit looks into the Indian Peaks Wilderness. I think I've only ever hiked there once, but given its proximity to Boulder I'm likely to return. I moved downhill quickly and finally saw another person just below treeline. It was a woman and her dog headed for Meadow Mountain, a smaller peak that I opted to bypass on this trip. I don't think I took any breaks the rest of the way and passed one small group that looked to be out for an afternoon hike. Other than those two moments, I felt like I had the trail, RMNP, and the IPW all to myself. I was back at the car just before 2 pm. Total distance traveled was 8.7 miles with 3683 feet of climbing. Total time on the trail was 5:27 with a moving average of 2.2 mph. Click on the map endpoint marker for additional stats.